Sir Ernest Shackleton went to Antarctica no less than four times between 1901 and 1922 on voyages of adventure and exploration. The most famous of these was what was officially called the "Imperial Trans-Antarctic Expedition" of 1914-1917, better known by the name of the ship involved, this was the Endurance Expedition. 35 slides with a short one sentence description, original pictures from the expedition. This lends itself in particular to younger students and for students to look through themselves. The webpages are clean with the only links being within the series of 35 slides and a homepage link from the top of the page. Click here to link to these slides, individually, or the slide-show using QR codes that can be printed on worksheets or wherever you want to use them. A time line of the Endurance expedition from August 1st 1914 when the ship set sail from London to September the 3rd 1916 when the rescue ship Yelcho reached Punta Arenas, Chile with all of the crew recovered from Elephant Island. A biographical time line of the life of Ernest Shackleton from birth on the 15th of February 1874 to the 5th of January 1922 when he died aboard the ship Quest at South Georgia. The links below lead to biography pages with pictures of each of the members of the Endurance crew. 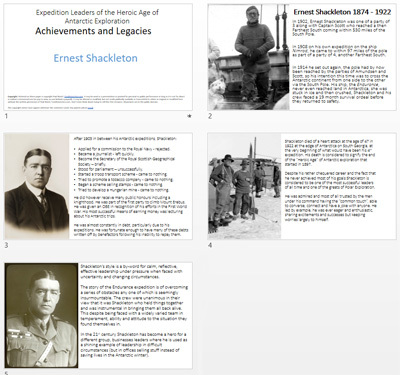 Some could be chosen and presented to a class as options so that individual students follow the links to identify with the men (there were no women) while on the expedition and then later in life. They could use what they find as the basis for a piece of writing, a condensed biography, a letter home (the only communication, though the letter wouldn't be received until after the men were rescued) a poem, thoughts about what they were missing, FaceBook page updates, Tweets etc. Some biographies have more information than others, those with a # are suggested as being more suitable. Hussey, Leonard D. A. # - Meteorologist - banjo player, "vital mental medicine"
Tom Crean, with a litter of sledge dog puppies on the Endurance. 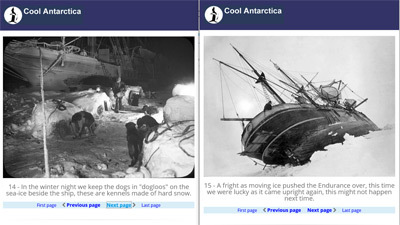 Endurance crushed by ice in the Weddell Sea, the ship sinks watched by a dog team. Voyage of the James Caird. Mountainous seas in the southern ocean made this one of the most incredible small boat journeys of all time. 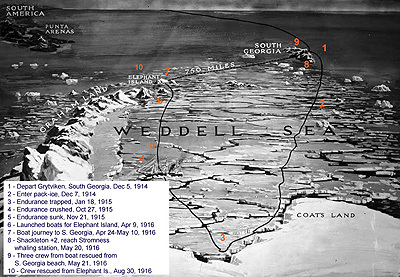 I originally sent these on Twitter as a series of Tweets exactly 100 years after the actual events took place from the 1st of December 1914 (2014) when the Endurance left South Georgia to enter the Weddell Sea to the 3rd of September 1916 (2016) when the rescued crew arrived in Punta Arenas, Chile. The messages are sent from an unspecified "anyman" observer amongst the crew and follow events as they happen being more frequent when more when more is happening. The diaries of some of the crew members were used as source material. e.g. This is the entire story in condensed form, it is still quite a lot of reading but makes it easier to find specific events. A proportional time line could be constructed to show how much time the "events" took, compared to how much time was spent mainly waiting around with little happening. Shackleton First went to Antarctica on the prestigious and establishment backed "British Antarctic Expedition" on the ship Discovery, it had ambitious exploratory and scientific plans. He was "Third lieutenant in charge of holds, stores, provisions and deep sea water analysis.". He took part in an attempt to reach the South Pole with Scott and Edward Wilson in 1902 the party of three reached a point 480 miles from the South Pole before turning back while they still could. In 1912 Scott and Wilson were part of a party of five who succeeded in reaching the South Pole, though they would all perish on the return journey. On the pole attempt, Shackleton suffered from scurvy and had a very difficult return journey, after return to the expedition hut on Ross Island, he was sent back home on the next available ship to recover. Upon returning to England, Shackleton began to plan for his next voyage south which he would lead himself, this would be the "British Imperial Antarctic Expedition" on the ship Nimrod. Another attempt was made on the South Pole, this time there were four men in the party led by Shackleton, they came to within 97 miles of the South Pole but again had to turn back while they were still able, Shackleton was never to actually make it to the South Pole. The Shackleton - Rowett Expedition 1921 - 1922 was to be Shackleton's last trip to Antarctica, named for himself as the leader and John Quiller Rowett the main financial sponsor. Initially it was intended to go to the Arctic, but the original sponsors pulled out. The Quest was a small and really quite unsuitable ship for the purpose, though following the fame of the Endurance expedition, Shackleton was overwhelmed by volunteers to accompany him, the eventual crew included eight old Endurance shipmates. After a difficult journey south from England and some time-consuming unscheduled repairs in Rio de Janeiro, the original plans had to be changed due to shortness of time and so the Quest arrived at South Georgia on the 4th of January 1922. Tragically and following declining health that he had tried to conceal, Shackleton had a fatal heart attack on board the ship at harbour on the 5th of January 1922 at the age of 47, so ending the Heroic Age of Antarctic exploration.